Forced to halt launch preparations due to the partial shutdown of the U.S. government, officials are targeting a mid-November launch of a Minotaur 1 rocket from Virginia's Eastern Shore on a technology demonstration mission with a record-setting payload of 29 satellites. The solid-fueled launcher was supposed to blast off Nov. 4 on a mission under the banner of the U.S. military's Operationally Responsive Space office, an initiative aimed at reducing the cost and complexity of the Pentagon's space programs. Stacking of the four-stage Minotaur 1 rocket on its launch pad typically begins a few weeks before liftoff. The Minotaur 1 rocket, marketed and operated by Orbital Sciences Corp., is a fusion of decommissioned Minuteman missile stages and new commercial solid rocket motors built by ATK. Orbital Sciences continued to work at Wallops through the shutdown on the next Antares rocket and Cygnus spacecraft, which are scheduled for launch in a window between Dec. 15 and Dec. 21, according to David Thompson, the company's chairman and CEO. Speaking to investment analysts in an Oct. 17 third quarter earnings call, Thompson said processing of the Antares and Cygnus vehicles was exempt from the government closure because they support the International Space Station, which kept operating at full capability during the 16-day partial shutdown. "The impacts on us were pretty modest with regard to current business," Thompson said. "All of our contracts were well-funded so we had no problems there." But missions not deemed essential to NASA or the military, such as projects required to protect life and property, were put on the back burner during the shutdown. A source familiar with preparations for the upcoming Minotaur launch, which is known as the ORS 3 mission, said the shutdown caused a day-for-day slip in the launch date. The launch has been tentatively rescheduled for Nov. 19. A technician works on the STPSat 3 spacecraft, the largest satellite slated to launch on the Minotaur 1's next mission. 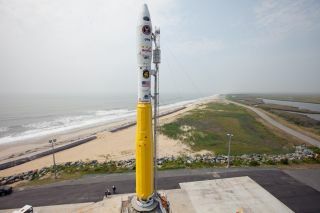 Orbital Sciences announced the ORS 3 launch contract in April 2012, and one of the launch's objectives is to demonstrate officials can pull off the mission on a shortened schedule modeled on a template borrowed from the commercial space industry. Instead of purchasing the rocket outright, the military signed a commercial launch services contract with Orbital, which is responsible for securing a launch license from the Federal Aviation Administration. The rocket will test a new GPS tracking system and an autonomous destruct device designed to destroy the launch vehicle if it flies off course. Launch vehicles usually rely on radar tracking from ground-based antennas, and a safety officer is on standby to manually send a destruct command if the rocket veers off course. The effort is aimed at reducing the workforce, time and cost required to launch satellites, according to the ORS office. The Minotaur 1 rocket will launch 29 satellites into low Earth orbit, setting a new record for the most payloads ever deployed from a single rocket. The largest payload is a technology trailblazer named STPSat 3, an approximately 400-pound spacecraft hosting five experiments to test next-generation satellite components and measure the space environment. Four dozen more satellites will launch stowed inside CubeSat deployment pods for release once the Minotaur's upper stage reaches orbit.